You’ve heard it before – if you want to succeed online you must build a list. Everybody seems to be saying it. Ever wonder why? Help more people than ever. And if you do that, it WILL come back to you many times. Develop deep and lasting relationships that will sustain you for years to come. Advertise anything you want anytime you want as often as you want … all FREE! Participate in joint ventures that will help you build your list even faster! I know these things are true because I have been doing just that for well over 16 years. NOTE: This is not theory – in 2006 I made a full time living with a mailing list of only 8,000 people. If I can do it, I believe you can do it too! The most powerful weapon in any marketing arsenal than a well-developed mailing list. Continually buy advertising to reach new audiences. Hope and pray that your sales letters convert because people won’t be on your list. Pay others who have a list to promote for you when you need a traffic boost. Experience higher costs for customer acquisition than other marketers. Experience lower lifetime customer value than other businesses. If you want a real freedom the best way is to build a list of your own. So let’s start building yours today! But what if you don’t have a list yet? Everyone who has a list now was in your shoes at one point. We all started with zero subscribers and had to build a list of our own. The good news here is that it’s not as hard as you think if you are willing to use the “slow and steady” approach instead of they hyped up “go from 0 to 100,000 in 30 days” approach. One word about “slow and steady”. While I am not advocating taking any longer than needed to build a list I am saying that putting time on your side matters … a lot. Think about how long you have been trying to make money online. Now think about this – what if you had added only 200 people a week to your list every week of that time? How many people would be on your list today? If you have been trying to make money online for ONE year, and you had focused on building a list from day one, you would have a list of 10,000 people right now. There are many ways to begin building a list – too many to cover here. So today let’s look at four ways that really work. All are free to do. Full disclosure: I used each of these when starting to build a list and still use each one of them today. They work! Go to your “sent email” folder right now and just scan the email you sent in the last month. If you are like most of us its hundreds of emails. Maybe thousands. But does your email does include an offer for someone to join your mailing list? If you send only 20 emails a day (including replies) then you are sending over seven thousand emails a year! What if only 1 in 7 people saw your link and joined your list? That’s over 1000 subscribers to your list … free! You may be thinking that many of the emails you send are to friends and family. Or that you send many emails to the same person. I thought that too. But one thing to consider is this – if you add an offer to join your list to your signature those who are interested will take it up and those who are not will ignore it. This is perfect because people are self-selecting, which is the essence of permission-based marketing. You will find, as I did, that people will occasionally forward your email as well. When that happens an entirely new audience gets to see your list building offer. It’s a win-win. Ever visit a forum and ask a question? How about making comments on blogs you follow and love? Many people have done one or both but don’t leverage the experience in their favor. The truth is, this is a great way to build a list with no extra effort. Just about every forum out there offers a signature line feature, yet we see thousands of posts with no signature. Almost all blogs encourage you to enter a URL when you comment but many comments contain no URL at all when they could easily include the URL of your squeeze page. If you post on your favorite forum, make sure to include a link where people can join your list. The same thing goes for commenting on your favorite blog. Again, free and very effective. Put time on your side with this one! When it comes to social media, you do not need to become a bleary-eyed obsessed poster. All you need is to focus on the big three – Facebook, Twitter, and LinkedIn, and have some presence there every day you work. So let’s talk about Twitter – is Twitter your friend or foe? Great marketing tool or total time waster? Here’s how you can use Twitter today to build a list with no money. Start following people you know of and replying to their Tweets. Make sure your reply makes sense and won’t waste people’s time. Fan Tweets – replying to a Tweet with something like “loved your book about ___” are 100% okay and often much appreciated. Once you have been following for a while you will get followers too, and become a recognizable name in your circles. When that happens, send a short Tweet about your new mailing list and where people can join it. If you want you can even automate this process by using a service like Hootsuite or Buffer. The key here is to create curiosity which creates the click and that leads new visitors to your squeeze page. And it can all be automated! Of course, you can use other social media to build a list as well. Other articles will cover those methods. But I find that Twitter is the easiest way to start for someone just starting to build a list, hence the specific suggestion here. The best answer is your blog. If you don’t have a blog there is simply no reason to wait any longer. The advantage of having a blog is that you can use it as a landing page only OR publish a full-on blog and build your audience even faster. Options are a beautiful thing! You can have an almost limitless number of blogs in various niches if you are a niche marketer. You can create virtually any number of squeeze pages too. All for no extra cost! If you can type, you can blog. And you should. Once you get a blog just put a form on it for your list and you are good to go! So there you have it, four ways to build a list of your own with no money and no traffic! Begin using these methods today and you will put time on your side. Sooner than you think, you will build a list of your own. Once you build a list of your own the possibilities become endless. You can take polls to uncover needs, offer recommendations, pre-sell products you create and more. All free! These reasons and more are why I have always said that having a powerful mailing list is a beautiful thing indeed! Thanks for the info on this blog. I definitely favorited this blog and will share it with others! Thanks for this great information. This is why I have been following you for years! Great, simple tips. I am picking back up where I left off a half decade ago with blogging and marketing. So I feel like I’m starting from scratch again. I know that feeling! The key is to make incremental progress. If you are starting over with blogging my best advice is to block out time on your calendar for posting and create an editorial calendar. It can be a lifesaver. Maybe I can get some attention to my website using a couple of these ideas. Also, I’ve heard that for affiliate marketing we should use a variety of cheaper hosts so google doesn’t see a bunch of affiliate websites from one IP or location promoting products. Not sure how to do this without incurring considerable expense? Then there’s the Rapid Mailer (Sean Donahoe) or Insty.me (Nick Jolin) platforms with all in one hosting, autoresponder & content marketing suite – do you recommend this model? I have been using Nick Jolin’s insty.me service for several years and can’t recommend it highly enough. Clarity and simplicity is what always found here, when i´m in doubt always come here for a piece of advice. You are a good coach, and I like coming here to get new information. Great post Charlie. My biggest regret was not building a list sooner. That’s a mistake I won’t make again. Now I have different types of lists for the various marketing campaigns I run. Listbuilding is the secret to making money online and can give you the ability to live a lifestyle that most people can only dream of. Thanks for the helpful tips! Wonderful post! Thanks so much! My list is growing slow but it does pay out!! Good solid advice as usual,im starting right NOW! Excellent post and such valuable information. Reading the comments are good too as is interesting to see what people are doing and what information they have. I do have a few questions; have you ever used craigs list for getting customers? My overwhelming question is the pros and cons of building a website or blog or doing both and if one has an advantage over the other? No doubt getting traffic and building a list is very important and all that you spoke of in this post I would readily use. I’ve not used Craigslist in a very long time. I don’t find it to be a worthwhile traffic source personally. Between a blog and an HTML site there is no difference from a list building perspective. I would go with the blog (and do) because it’s just so much easier to build. G’day Charlie from Sunny Queensland! Those four tips you have presented for us are really helpful. I will certainly be implementing all four of them. If you have opportunity any time to discuss how to set up a mailing list so that we can send to the whole list at one time that would be helpful. Thank you again for sharing your experience and expertise. Oops. Just fixed that. Thanks! Great tips Charlie, especially the idea of creating curiosity with your Twitter posts. Bland posts get almost no results, but questions or shocking statements get clicks and traffic! Thank you for this helpful information. You explain each methord clearly. I have twitter account, but I didn’t follow many people, and I never thought of posting fan tweets. I will start following more people and posting fan tweets as you suggest. Thank you. Glad you found that tip useful. Hi, thanks for the tips. For the twitter part, how do i start from zero? Simply follow some random strangers first? Following in order to be followed back will build numbers. From there you need to share high quality information, get into conversations, retweet and generally be in touch to build relationship. Charlie, Sorry to post so long after this post – I have been extremely busy and only got to read it now. Your suggestions are very good and i have followed them in most stages of my online career. However, having subscription forms on your webpage doesn’t help if you don’t have traffic coming to that webpage. No traffic = no signups to your list. I submit that one DOES have to get SOME traffic to your site in order to build your list, but nevertheless, your advice is good and should be followed, so that whatever traffic comes your way can turn into a loyal subscriber. If it isn’t there, you ain’t gonna get anybody – at least by having it there, you stand a chance. Obviously, this does not include using email signatures. This one tip alone can create a whole horde of new traffic and signups to your list. I like using this one when forwarding jokes to other people, because most people are notorious for forwarding them to other people too, including your signature. I was never saying you don’t need traffic. You are right that one can only build a list from visitors. That’s why I created my Driving Traffic Quick Course! When used together – driving traffic using proven and conservative methods and making sure your list building is working too – they can build a real online business. Thanks for another great tutorial, Charlie! I was happy to see that we are already doing what you are suggesting on our site, learncomputer.com. The only other variation we have, which might be of interest to your readers is we have a small signup form at the bottom of every blog post (vs. the comment box) that encourages people to sign up. We noticed it being effective because more people sign up for our newsletter from there than actually leave comments. We use AWeber as well. Thanks Michael. I do use and recommend the newsletter signup on blog comments option. It works very well indeed. I think popups are incredibly effective when done right and incredibly annoying when done poorly. I’m testing a product now that will be one of the first in my new review series that is working well. I’ll keep you informed. I know you are a good internet marketer that’s why I have subscribed to your newsletter, but to be honestly I didn’t make any money from those ebooks which I purchased in the past about internet marketing and I will not mention there names of those famous so called gurus here because earning money online isn’t very easy for people outside U.S.A. U.K. and Canada. Any way your list buiding techniques mentioned here are really the best. Thank you for subscribing. One of the great things about working online is that you can reach a global audience so you really don’t have to live in the US or UK or anywhere else to do well online. Many of my members who are doing well live in Australia. We have members who are succeeding in many different countries. I appreciate your comments and wish you well. Hey Charlie, could not agree more! I live in Australia and first started online in 2001. I literally went from living on Sickness Benefits to earning way over 6 figures in residual income within 3/4 years with my first HBB. I did it from a mattress on the floor, using a laptop and the phone and built from Australia an organization mainly based in the UK. With technology the way it is it does not matter where someone lives. People are people and the principles of success still apply whether you live in the USA or Australia. It’s not harder Syed, it is harder only if you think it is. Been a member of DOE for five years at least now too. Love Ezine Marketing which is one of my main methods so thanks Charlie. Thanks Cristina. I can relate to the back thing. Nothing on the level you describe but I’ve been in therapy for it since December and am still working from home in pain. Looking forward to the day I say goodbye to the pain meds and can get on with work and life. Appreciate your kind comments. The only thing that matters is if something works. Thank you for your comment. Thanks Charlie for your great content as always. I particularly like Idea 2 so I had better follow it for this comment! Btw, as I understand it the restriction on ads on wordpress applies only if they are hosting the blog. Yes – it’s very important to understand what restrictions apply before putting in the time and effort. Thanks for taking the time to comment. Happy you liked it. Much more to come. Should I be using the SAME website url whenever I comment ? I have been using different ones depending on the blog topic. Who sees it? Just Google? You can do that or tailor it to the topic. Search engines see it but people who read comments often click too if the comment resonates with them. thanks for the link for CopyBlogger. One of my favorites. Great material about more than just copywriting. Nice tips as usual, list building should be at the forefront of any one building a business online. I am absolutely going to make use of these techniques to build up my lists. I have been searching for new, new list-building methods that are both effective and ethical (and won’t cost me an arm and a leg), and after having read this article, I see that it is possible. Just want you to know I really appreciate the way you take the time to offer great tips for people to market their products/ideas, especially email marketing. I am a memer of your “Directory of Ezines”. Sorry to say, I haven’t done much with it, but try to read all of the info you provide whenever I can. I had back surgery last year and have had an awful time recuperating from that. And I still work a job as a secretary at the local schooldistrict 10 hours a day! I am also 72 yrs. old and want so badly to retire! I know your program and your fantastic help will get me and my husband where we want to be, retired!!! I just need to start applying all the info you so freely give. I have a lot of email friends and other contacts, so I will get an aweber account and start on that retirement! Thank you SO nuch for your wonderful encouragement! Thanks Charlie, I have enjoyed and promise to make good use of it. God bless you. Thank you Charlie, this article had some very good idea’s that were right under my nose but I had not given them a thought. Old novice here! Thanks for another informative post. I particularly think the Twitter method you outlined would be the easiest one to implement cos the world and it’s wife uses Twitter daily. Thank Charlie, great stuff again, will put this into practice mate & just purchased optimizePress , cant wait to go though training videos etc, Cheers Criss Matesic. newbie, would it be better to use http://www.blogger.com or Typepad? Of the three I like TypePad best. But it’s really your call. One thing though is that WordPress.com does have some rules about you putting ads on your own site from what I hear. This is hearsay since I don’t use them but do check that out. You want as much control of your own site as you can have. Thanks you Charlie for the advice1 I have been paying for advertizement but lately my results have not been very good. Thank you again, Charlie. You always give so much! I was feeling bad because I didn’t have any money and wondering how I could ever get started and you sent this terrific message of how to make a list without money. I realized that I didn’t have to undo all of the wrong actions I have taken in a year and a half before making the right actions now. In fact, taking a right action puts distance between my wrong action and me. Every step done correctly brings me one step closer to success. But this has only seemed possible because of your help and suggestions, Charlie. A very deep Thank You. 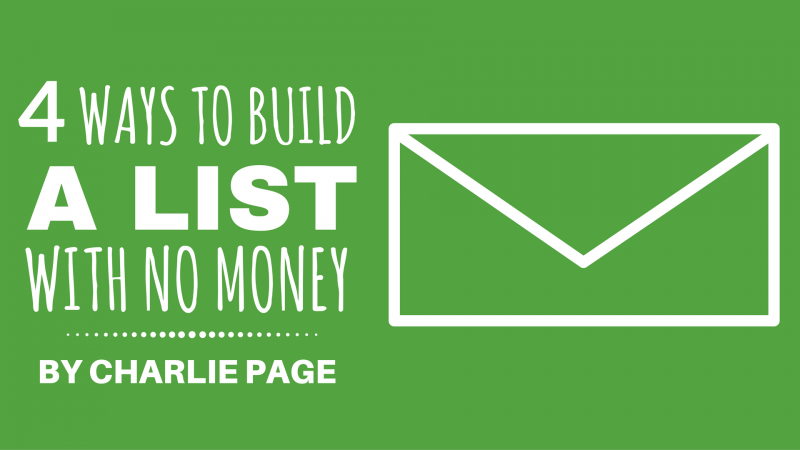 Thanks Charlie for the information on building a list………………….this gives me a direction instead of jumping from one idea to another as I have been doing. Don’t fear success. Embrace the challenge. You will need a mailing list service like Aweber if you want to do anything real with a list. They store the names for you and send the email from their servers, not from your computer. This way there is no blocking. They also help with the landing page and forms you need to build the list. You really can’t do it by running a program on your computer that sends email or from your email program. That might work for a tiny list but it’s a bad choice all the way around. Professional companies like Aweber offer many benefits and are a tool that is necessary for list building. I recently moved my wife and 2 children back home to Texas after living in NC for about 9 years. I’ve been in IM now for about 1.5 years part-time and I’ve build a list of about 2,200. I’m coming out of Egypt and entering into Canaan but its been a fight for me. I’ve made a few hundred bucks here and there, roughly 3k last year. I want to make 80k this year. Iron sharpens iron and in order to be a great leader I feel that you must be a great follower. Will you lead me? Welcome back to the promised land of Texas. Having 2200 is a good start. The key with a little list is to make sure what you share is consistent with why they joined the list. They almost certainly are buying things so why not let them buy from you? The key here is to know your list well enough to know what they need and then offer it in such a way that they get added value. I will be happy to help you as much as time allows, but please understand that my time goes first to my members (and we have lots of members) so I can’t mentor you one-on-one. I am happy to answer occasional questions via my ASK Charlie section (in the navigation menu of the blog) but I never hide the fact that my time goes to members first. Not trying to sell you a membership, just saying that’s how I work and have for over a decade. Going from $3,000 in income to $80,000 in income in one year is a large undertaking. You’ll need to work hard and smart and make the right moves and, even then, few can do what you propose to do. The Internet is the right platform for rapid growth so I’m hopeful you will get it done. Good job with the 2200. Now on to the 80K. Back after a long illness and trying to catch up. Great article, you are right on the button. Twitter is a great way to do it. I am using other social media and GetResponse plus a few other items of clever stuff to build my list. I appreciate your mail, as always. Indeed, the list is so very important and I am just beginning to develop mine, albeit almost three years into an effort. I knew you would have valuable information for me and have taken the unusual step of reading your post. You have not disappointed. Legitimacy in my efforts has always been missing, the lonely marketer that I am. I am now sure I am on the right path and will continue in my efforts with renewed vigor. I believe that the essence of Internet marketing must include a measure of perseverance, the one commodity that I do possess. I shall persevere and am thankful to have chosen specific individuals i have found valuable to my efforts, you being one. Off to increase the exposure of my opt in link. Hey Charlie, I couldn’t agree more, one needs to build a list from the word go. Many people ignore this fact and only start building a list almost when it’s too late. I was one of them and didn’t realize back when I started back in late 2007. Amen to that. I always use a squeeze page and a pop on exit to communicate with those who don’t want to be on the list. Good for you. Blog Broad Cast or Newsletter sign up…should you use one or both on your blog? You need both. The newsletter signup gets them on the list. The blog broadcast will only send to people who are on the list already – it does not add people to the list. Great tips, and they all are very effective. I would add on your blog when trying to build up your list too add an Aweber lightbox popup, or a footer slide in encouraging people to sign up to your list. These both work real well and they will increase your opt-ins a lot faster than a standard email sign up form . Hi Charlie, thanks for the great article. I hope you dont mind but I also added your blog to my blogroll. I don’t mind at all. Thanks for the link in. this is mean a friend in need is a friend in deed . Your presented list-building sources are timely, fresh, and quite on-point. Your step-by-step outline (as illustrated) should be of great service for all who decide to make their way through these logical list building strategies. As you and I realized through our years together, there is immeasurable value in the quality list we have built, managed, and maintained. Thank you for all the brilliant and caring work you do! It’s amazing how time becomes your ally when you structure something right and stick with it. You’ve been a model of consistency over the years and I know that is one reason why your site is so helpful to those who visit. Great suggestions. I do use all of them, but you gave me some ideas for more effective use of Twitter. Thank you for these helpful ideas. Twitter can be a great list building tool. If you know other Twitter list owners consider cross promoting with them too. That works very well and costs zero. Thank you Charlie, you are always so encouraging and if the tips above are simple, how much more do we need reminding of them. Think I will have a little Tweet. We don’t think about how many emails we send most of the time. But each one can be a silent salesperson and not be pushy at all if we use curiosity and are committed to delivering value. I’m glad you liked the article. Thank you for leaving a comment.